Professor Shirley Chiang joined the faculty at UCD in 1994. Her research in the area of surface and nanophysics emphasizes high resolution microscopy of surfaces and instrumentation development. She has studied nucleation and growth phenomena for epitaxial systems of both metals on semiconductors and metals on metals, including surface alloying behavior. She is particularly well known for her work on imaging individual small molecules on metals for chemical reactions. The study of the properties of solid surfaces has important implications for the development of new materials, the fabrication of electronic devices, improvement in magnetic storage devices, and the understanding of chemical reactions at surfaces. Professor Chiang's research has had a very high impact on the field, as evidenced by over 5500 citations to her 90 publications. Professor Chiang's research uses very high resolution microscopy to make real space images of solid surfaces. The scanning tunneling microscope (STM) allows images of solid surfaces down to the atomic level, and the low energy electron microscope (LEEM) permits the measurement of real-time movies of surface growth and structural phase transitions. All studies are performed in ultrahigh vacuum systems in order to carefully control the environment around the sample during the measurements. Other more conventional surface preparation and analysis techniques are also used in the laboratory, such as x-ray photoemission spectroscopy, Auger spectroscopy, low energy electron diffraction (LEED), electron beam sample heating, and argon ion sputtering. 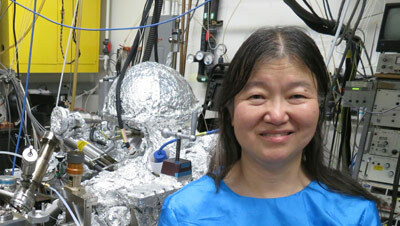 Professor Chiang's recent research involves the measurement of the nucleation and growth of surface structures of several different metals on germanium and is funded by NSF. Recent projects in her group include the measurements of a novel surface structural phase transition of Pb on Ge(111); growth of several phases of Ag on Ge(111) and Ir on Ge(111); hopping motion of islands for Au on Ge(111), and remarkable one-dimensional growth of Ag on Ge(110). She also collaborates with theorists to model some of these materials systems. In addition, while on sabbatical leave in France , she did measurements on graphene on SiC using both STM and LEEM; she is continuing collaborative work there using the SOLEIL synchrotron radiation facility to do x-ray photoemission and infrared spectroscopy. Visiting Professor, Commisariat à lÉnergie Atomique (CEA), Saclay, France, 2008-2009.